Random Anny .Com: Rite Aid loves us! It seems like only the other day that I was rueing Rite Aid's place at the bottom of my drugstore trifecta. While they did not adopt any of my ideas they came up with something I appreciate even more - a Wellness card with sliding savings! 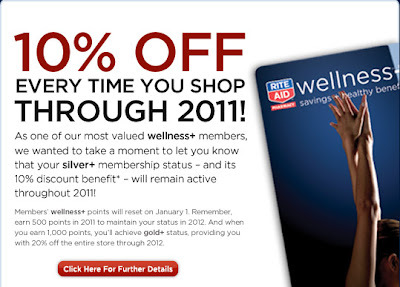 With their Wellness card (their free store membership card) if you spend $500 in-store in one calendar year you will earn a 10% discount on stuff. If you spend $1000 you get to save 20%! This program started mid-2010 and I reached $500 in November. This has been great but I was already regretting having to start over in 2011. As you can see the discount will continue through all of 2011! This is both happy and sad. On the happy side, I get to save 10% for a long time. On the sad side I won't be able to get to $1000 and save 20% until 2012 and the world may end then. Craigslisted means I have a picture to show progress! In decluttering news I chucked my wallet today. I also sold most of the candles from that garage sale this summer. Have you ever lifted 50+ candle holders? They're kind of heavy. 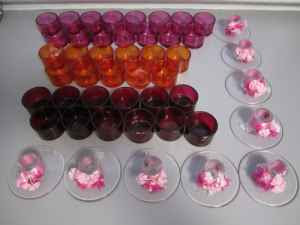 I kept the red tea light holders and case. Its currently full of other candle holders. Guess I should see what I can pitch from there.